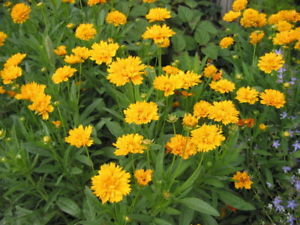 This selection forms a low mound of leathery green leaves, bearing upright stems loaded with large, semi-double, clear yellow daisy flowers for many weeks, starting in late spring. Easily divided in early spring, this should be done every 2 to 3 years. Tolerant of hot, humid summer climates. Excellent for borders, as well as in containers. Grows to 12” tall with a 14” spread. Attractive to butterflies. 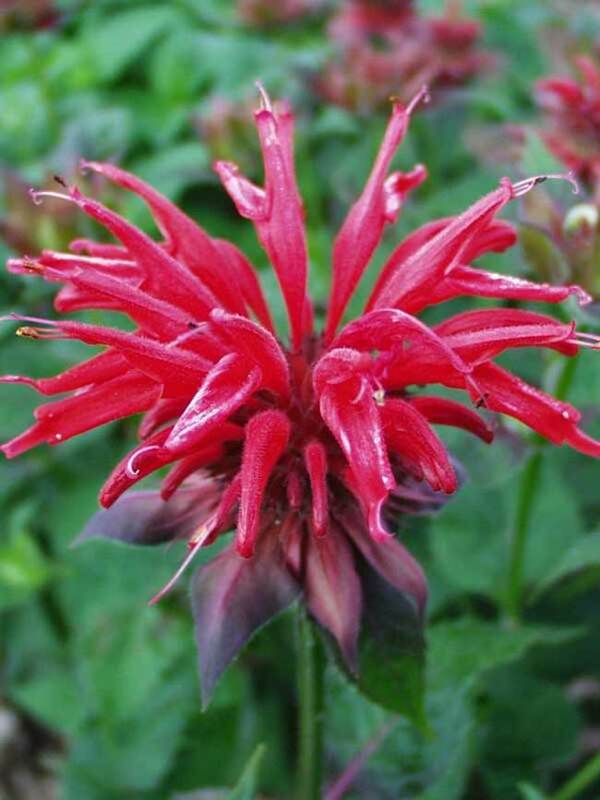 Scarlet beebalm is a brightly-colored native flowering perennial with fragrant foliage. It attracts pollinators such as bees, butterflies, and hummingbirds. It grows approximately 3-5 feet tall and prefers part to full sun. 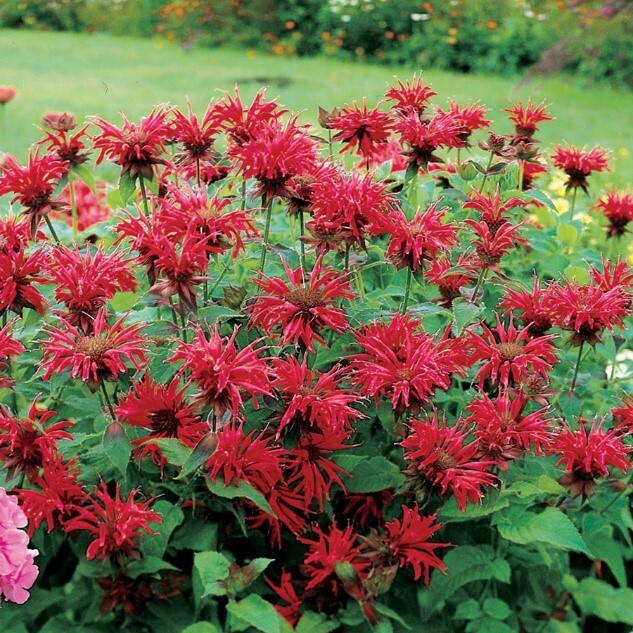 Beebalm will tolerate slightly moist soil conditions. Blooms mid to late summer. Pick flowers to encourage a second bloom. Creeping phlox flowers in mid to late spring. 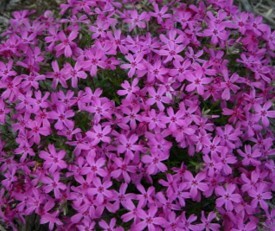 Also called moss pink, this mat-forming evergreen perennial grows 4-6 in tall and 2 ft wide. This full sun plant requires good drainage and is drought tolerant once established. Attracts butterflies. It's native to somewhat dry, rocky or sandy places, open woodland areas and slopes in our region. Cut back stems by 1/2 after flowering to renew foliage. 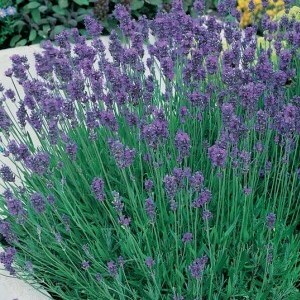 'Hidcote' is a shorter form of english lavender, grows 20" tall, spreads 20". Dark, violet purple flower spikes. Silvery grey, semi-evergreen foliage retains its sweet fragrance for years when cut. Excellent for cut or dried flowers. Also makes a low growing hedge in average to dry soils and day-long full sun. Attracts butterflies. 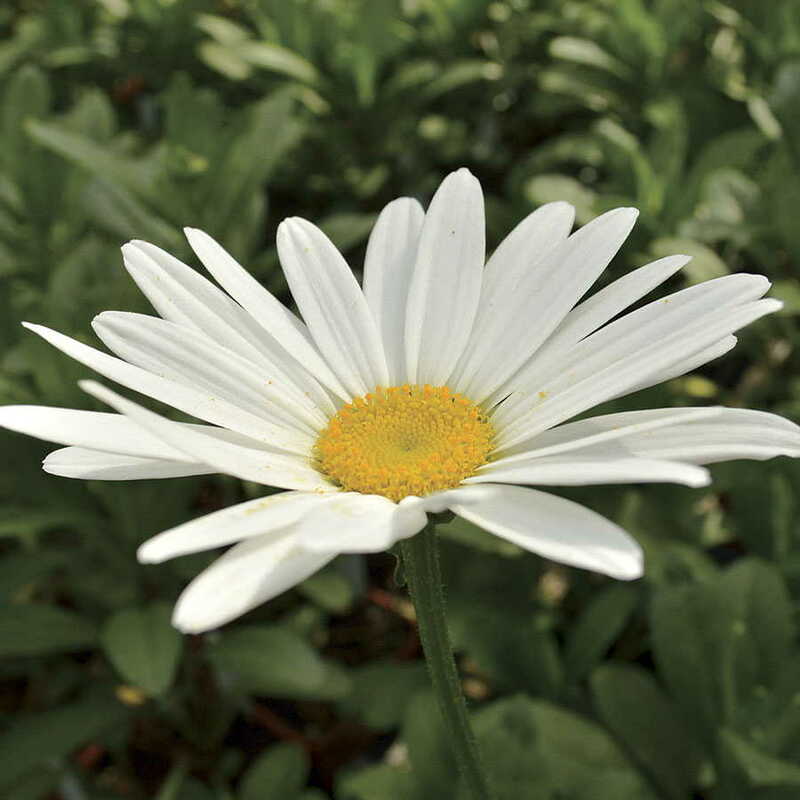 A classic perennial with robust white blooms. This is a very tall selection (35” tall) that exhibits excellent tolerance to summer heat and humidity. 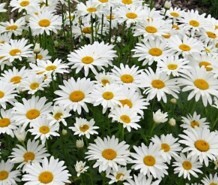 Flowers are large single white daisies with a yellow eye, valued in the garden and excellent for cutting. Divide plants every 2 to 3 years to maintain vigor. Removing faded flowers regularly will greatly increase the blooming time. Attractive to butterflies. 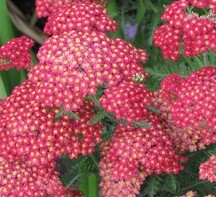 Achillea is a common native summer perennial with flat-topped yellow, red, pink, and peach flowers. This hybrid selection has cherry-red, gold centered flowers, later fading to light pink and creamy yellow. Grows to 27”. With their sprays of soft, feathery, aromatic foliage. Inclined to spread, so site this carefully or plan to reduce the clumps each spring. Achillea also attract pollinators and is drought-tolerant once established. Achillea is a hardy plant that loves full sun and flowers repeatedly throughout the summer. Deadhead spent flowers to encourage new blooms. 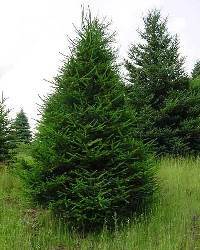 Fast-growing spruce reaches 6' in 6-7 years, with dense dark green needles less than 1" long. Will grow to 125' in average soil; prefers some moisture, but not wet conditions. Makes an attractive landscape tree or a good windbreak. 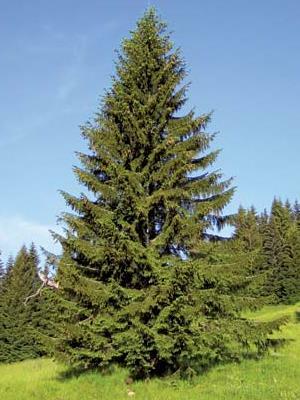 Medium-fast growing fir reaches 6 feet tall in 7-8 years. Soft, green to blue-green 3/4 - 1 1/2 inch needles. Will grow more than 150 feet tall in moist, well-drained soil and full sun. Exhibits poor growth in heavy, wet soil. A very popular Christmas tree due to its superior fragrance and needle retention. Medium growth, 6’ in 8-9 years reaching 100’. Soft, 2”-3” long, silvery blue-green needles. Best growth in moist, well drained soil with full sun tolerating high temperatures and dry soil better than all other firs. 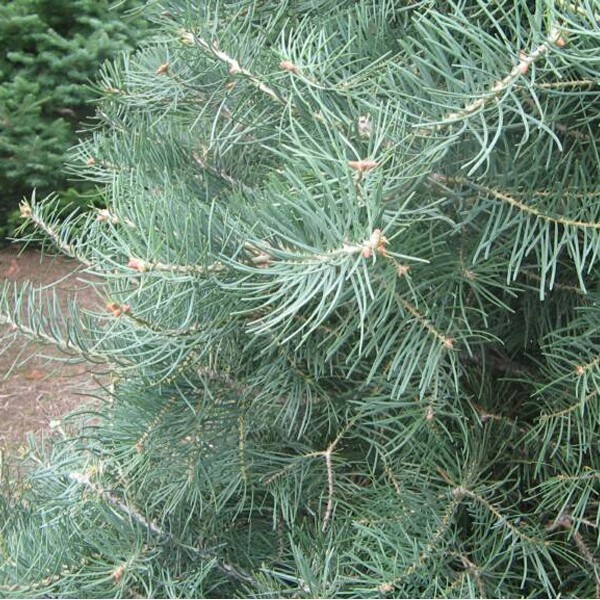 One of the most beautiful and carefree evergreens making a prized Christmas tree with good needle retention and stiff branches. 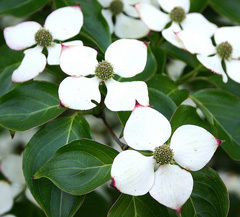 Kousa dogwoods are medium-sized flowering trees, reaching 30'. They are similar to flowering dogwoods but are hardier. Prefers full sun to partial shade. Beautiful white flowers in the spring, and attractive red foliage in the fall, with red fruits. Grows best on moderately moist soil and will tolerate some shade. Makes an excellent landscape tree and provides food for wildlife. Deciduous conifers, larches drop all their leaves each autumn and are among the earliest trees to come into leaf in spring. Their needles are soft and appear in tuft-like clusters. They can grow to 60-100’ tall, and have a pyramidal shape, horizontal branching, and drooping branchlets. Intolerant of shade. 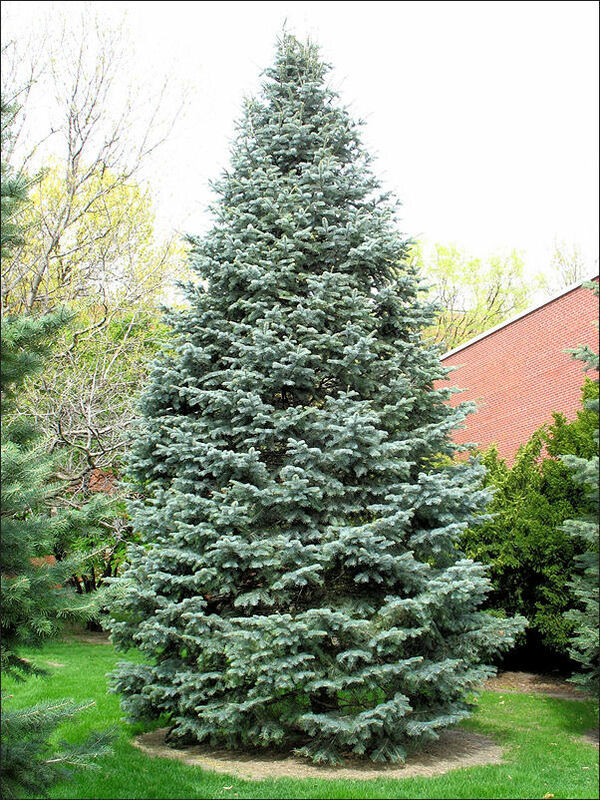 A unique and beautiful tree to add to your property! 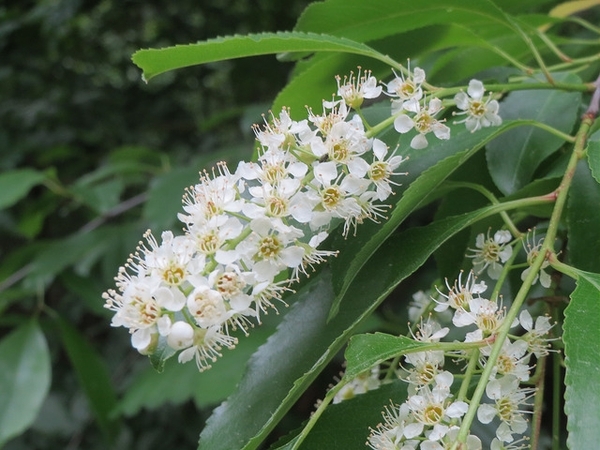 Black cherry is a fast-growing native cherry tree, with fragrant white flowers in early summer and producing dark red cherries in late summer. Prefers full to partial sun. Grows to approximately 50-80' in height with a narrow-columnar to rounded crown. Good species for wildlife food. Has attractive fall foliage and makes a good shade tree. 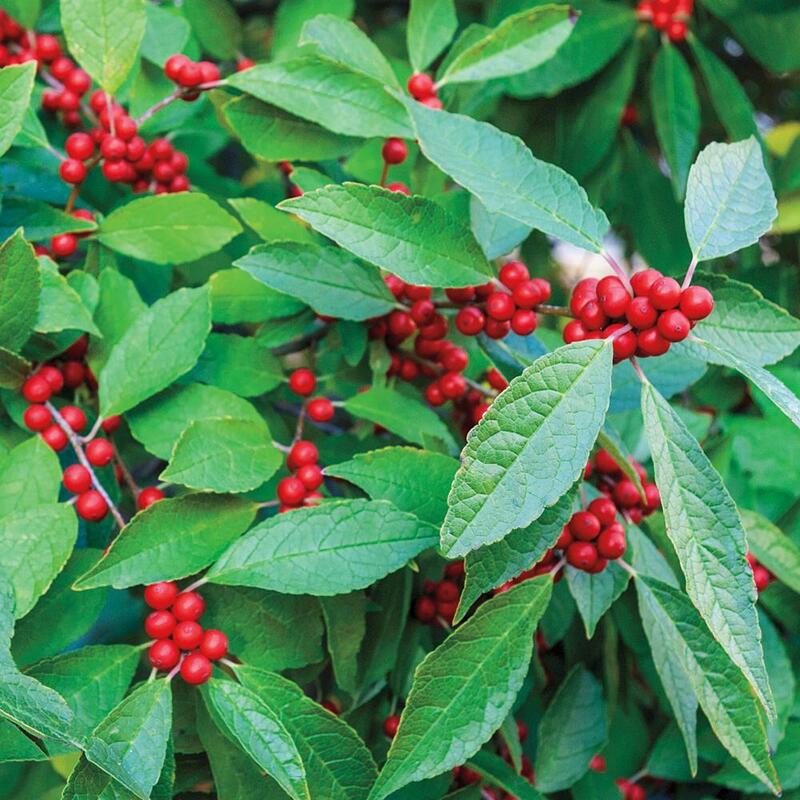 Winterberry is a native shrub with bright white flowers, and red berries with vibrant red foliage in the fall. 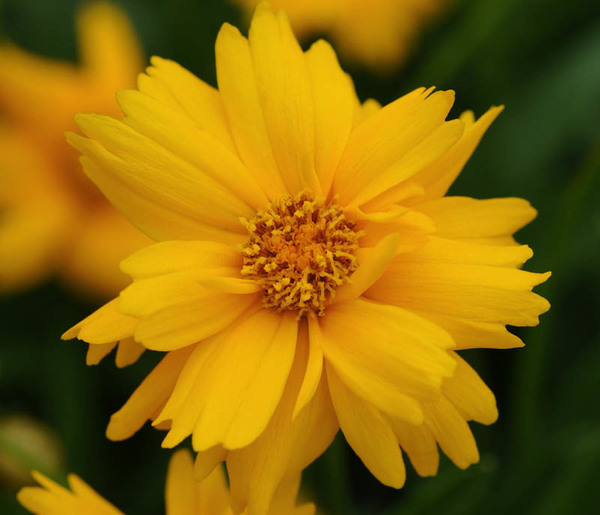 It grows best in moist soil with full sun to part shade. The shrub grows to 5-10 feet high and 3-5 feet wide. 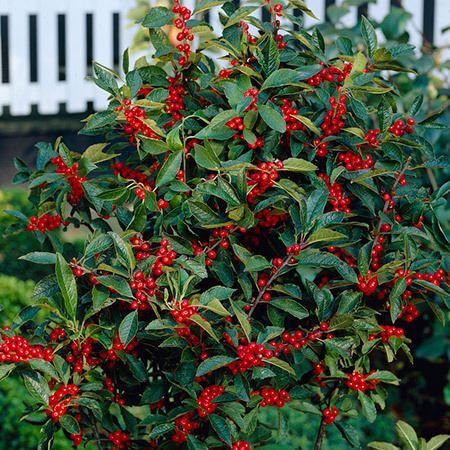 This shrub is excellent for borders or mass plantings. Seedlings are 12-18”. Native to Dauphin County. All apple varieties are semi-dwarf and will reach an average height of 15 feet. No staking or support is needed. 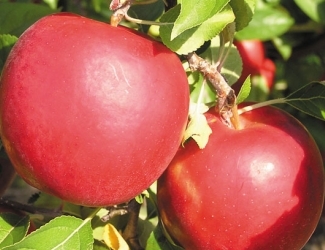 Apples require another variety planted nearby to cross-pollinate and produce fruit. 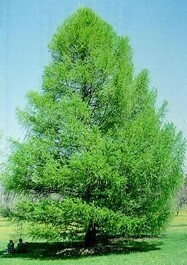 Buy at least 2 different kinds or plant within 100ft of an established tree. Sweet cherries listed are self-pollinating and do not require another sweet cherry to produce fruit. Crimson Crisp® is a firm, deep red-purple, crunchy apple. 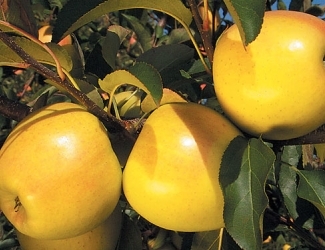 Its crispy yellow flesh holds a sweet-tart flavor, making it a great fresh-eating apple as well as a juice or cider variety. This medium-sized apple is ready for picking in mid-September to October. It stores well for at least four months. This is a semi-dwarf tree. 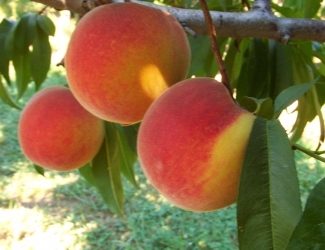 The Sugar Giant is a large white peach with exceptional flavor and firmness. Good for fresh eating, canning, and freezing. 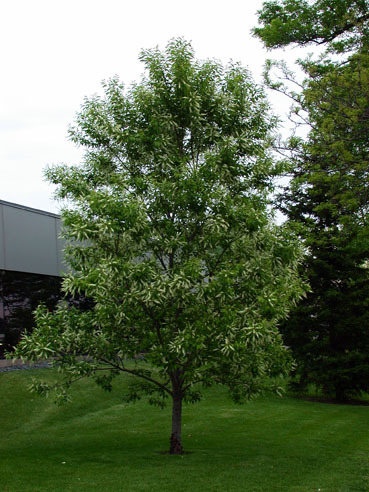 Trees are very vigorous and productive with medium resistance to bacterial spot. Fruits mature in late August to Early September. Limited supply. 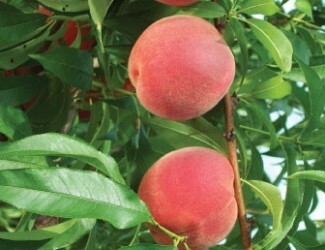 The Contender peach is a high-quality freestone peach variety. The fruit very large and firm, with excellent color. Fruits mature in late August to early September. Trees are hardy and very productive. Limited supply. Prices are listed on the order form, which can be downloaded by clicking here. Earliglow is the #1 early-season variety. Fruit is a medium size with firm, glossy skin and firm flesh. Plants are very vigorous with good disease resistance. Recommended for beginners. Early season ripening near the end of May. Northland is a cross between highbush & lowbush species, making it the most cold-hardy highbush variety – blossoms can tolerate light frost. Medium size, dark blue fruit is firm with excellent wild berry flavor ripening midseason. 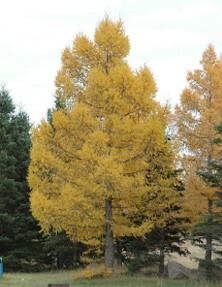 Grows 4’ high with brilliant orange fall foliage and a low, spreading habit. Heavy yields nearing 20 lbs. per bush at maturity. The leading commercial variety grown ripening in midseason. 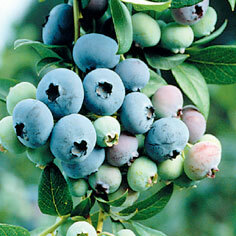 It produces high yields of large, bright blue berries that are firm and grow in large clusters. The berry flavor is superb, fresh or frozen. Bluecrop is known for its hardiness, vigor and consistent production. The plant grows to a height of 4-6 feet. Plastic tubes for protecting deciduous seedlings from rabbits and deer, drying winds, and lawnmowers. Tree shelters also increase the growth rate of young seedlings, even if the shelter is taller than the seedling. Available in 2-foot and 4-foot heights (use 4 foot tube where deer may browse seedlings). Not for use with evergreen seedlings. May be cut to fit over fruit trees to protect trunk. all strawberry plants sold in bundles of 25.
space plants 18" on center in rows 3'-4' apart. dig holes deep enough for roots to go straight down. Keep soil line in middle of the crown. remove all blossoms the first year for strong, high-yielding plants. 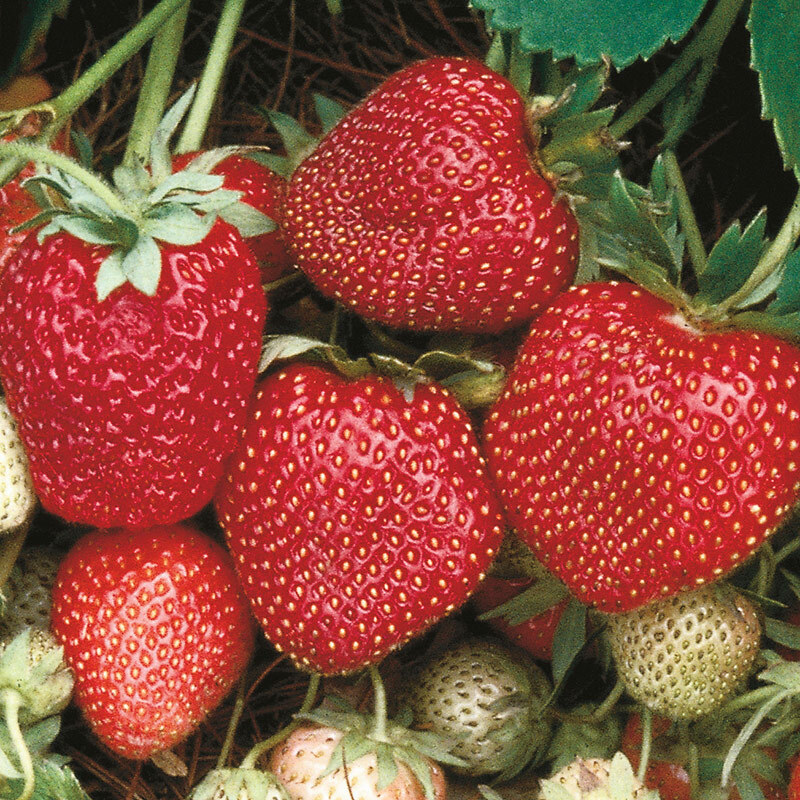 click here for strawberry-steps-to-success planting guidelines. plants are 1 1/2 years old; consisting of a 15"-18" tall stem with a 3" wide x 6" long root system. space plants 4-5' apart in acidic soil, pH between 4.5 - 5.0. Peat moss is a good acidic soil amendment. for best fruit yield and size, plant at least two varieties for cross-pollination. remove all flowers the first year - Do NOT allow berries to develop. 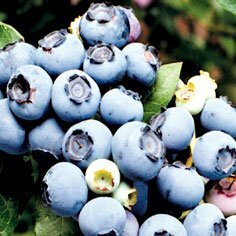 click here for blueberry-steps-to-success planting guidelines. 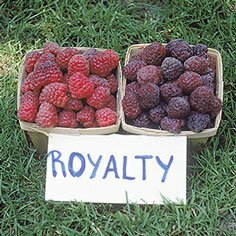 Royalty is the most popular purple raspberry variety. The plants are extremely productive with large, sweet, purple fruits. Berries may also be picked when slightly immature and still red and firm. Good for fresh eating and jams. Eludes spring frost damage, as it is a late- season variety. 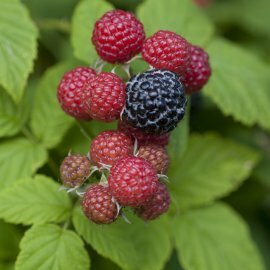 Bristol is a black raspberry plant that is a high-producing early variety whose upright growth and cluster formation make its berries very easy to pick. It has medium, firm, glossy fruit with the best black raspberry flavor. Moderately hardy but very vigorous, Bristol shows tolerance to powdery mildew. plants consist of a cane and "L" shaped root system. Cover uppermost root with about 1/2" soil. space plants 18"-24" apart in rows spaced 8-12' . plant in well drained soil, pH between 6.0 - 6.5, rich in organic matter. Well aged compost is a good soil amendment. trellising recommended for all raspberries. click here for raspberry-steps-to-success planting guidelines. 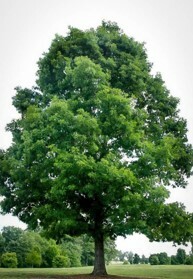 White oak grows 50-100' tall, with a spread of 50-80' at maturity. It prefers full sun to partial shade, with at least 5 hours of full sun per day. Tolerant of a wide range of soil and moisture conditions. 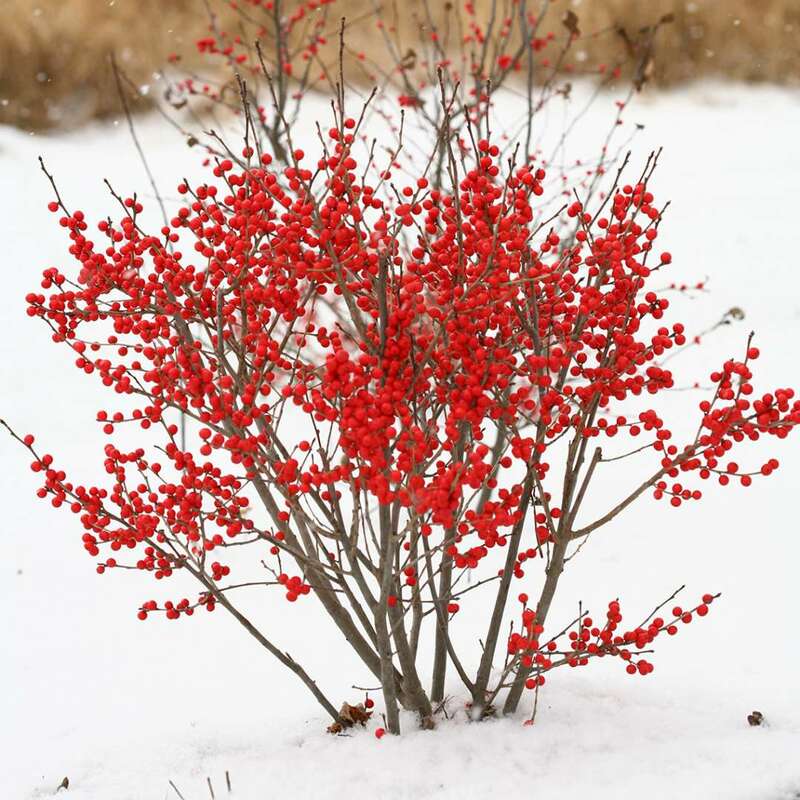 Makes an excellent shade tree, provides habitat and food for wildlife, and has attractive red foliage in the fall. 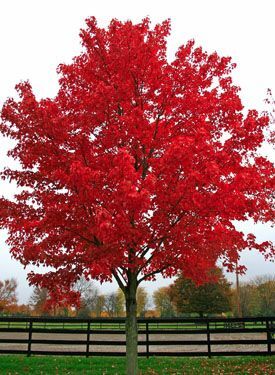 Red maple is a native, medium to fast-growing tree. At maturity it can reach 50-90' in height and can grow in an oval, rounded, upright, or erect shape. It has beautiful fall foliage, with red buds in winter, and red flowers in the spring. Thrives on wet to dry sites and even tolerates shade. Sparkle is widely considered the best strawberry variety for making jam. Sparkle strawberries are medium-sized and ripen late. Planting Sparkle with other earlier varieties extends the fresh fruit season. 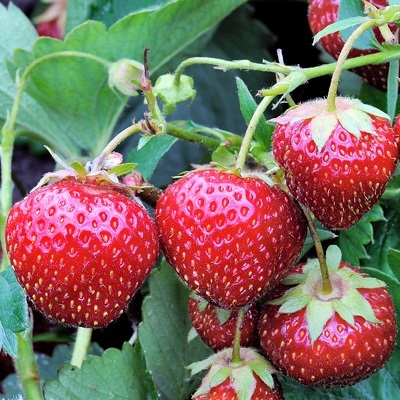 Strawberries from Sparkle plants are deep red and have excellent flavor.